The most famous pyramids are the Egyptian pyramids, these were built in ancient Egypt. Which is also where you will find this, though its in the Neopets ancient Egypt, "The Lost Desert." 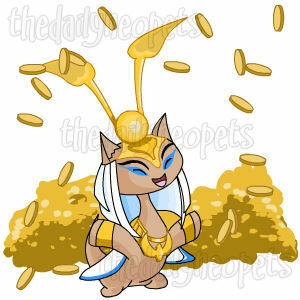 Pyramids is one of Neopets early games, and one of the few games that is played in the Neopets layout (non-flash game). Like a few other games, this game required a lot of logic to fully complete the board. It looks quite confusing at first, though it's really quite simple to play, but it does require logic. 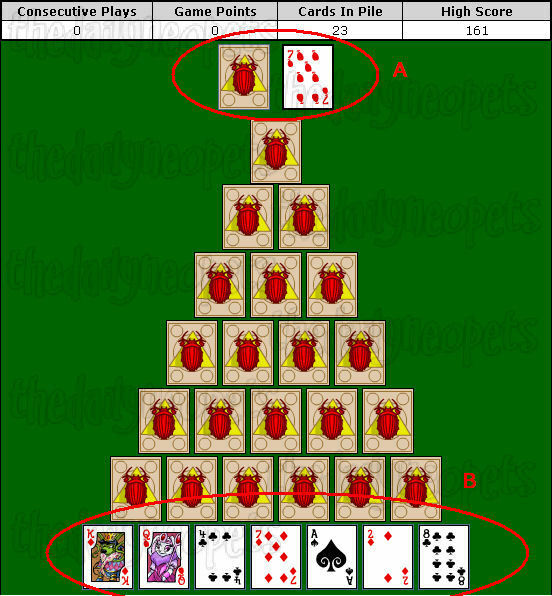 The objective of this game is to remove all cards in the pyramid. Sounds simple right? However you can't cheat and remove them by hand like you do when playing at home. :P Here are what "A" and "B" mean. A: This is your deck, it contains 24 cards at the start of each game. B: This is your pyramid, you can only remove the cards which are face up. As you can see by the deck, the card on-hand is a 7 of neggs. Look through your cards in your pyramid. You can remove a card that is one less or one more than your card on hand. So in this case, you'd click the 8 in your pyramid. After you select the 8, that will become your new deck card. You would have to continue like this. Though at some point you may find, that there are no possible cards available. If there are no more possible moves available and you have cards left in your deck, click the deck (to the left of your on-hand card) to draw a new card! You have won ___ Neopoints! Your total score has been updated to ___! You have played _ game(s), and you have cleared the pyramid _ time(s). Your current win streak is __ game(s). The amount of Neopoints you have won will depend on how many cards you have cleared. The rest of the information will update whether how many games you played and how many times you have cleared the pyramid. Through playing pyramids you may win up to 2 different trophies. One of the 2 trophies is the high score trophy and the other you can get by a more unknown method. You can get the bronze for beating Pyramids twice. You can get the silver for winning 5 times. Finally you can get the gold by beating Pyramids two times IN A ROW. Always clear the cards at the edges first. Always clear cards at the bottom of the pyramid first. If you have to chose between two cards on the same row, pick the one that overturns the most card first. The Snowager is awake. He'll be sleeping in 1 hour, 51 minutes.